Sam Hunt is arguably New Zealand's best known poet. Helped along by his irreverence, distinctive style and iconic delivery he's almost certainly the only living poet to have household name status. His talent as a poet is recognised across generations from the literati to the bloke at the pub. With his stovepipe trousers, open shirts and unruly long hair Hunt looks like a seventies rock star. In fact Hunt has been closely associated with the NZ music scene, he has often shared the bill with rock acts and on occasion has collaborated on musical projects, the most recent being Falling Debris, where his poems became the lyrics for music composed by David Kilgour. For a long time I've been trying to hunt down Hunt's first musical foray. In 1972, following a number of double billings with rock group Mammal, the post and the band released an album together, Beware The Man. Nowadays the album goes for serious money on-line, and it's never been re-released. Thanks to Tony Backhouse, songwriter, guitarist and keyboardist with Mammal, I've finally managed to get hold of the songs, ripped from the vinyl to CD. Many of the pieces take Hunt's words and set them to music sung by the members of Mammal, others feature the poem being delivered by Hunt which is then followed by a musical interpretation. The most interesting however are those where the two come together and Hunt's delivery is set to music, as it does on 'Sandshoe Shuffle' and 'Con the Man and Melissa'. An album of Hunt's poetry was released around 1980, but the next musical collaboration I've been able to track down came in 1999 when he appeared on The Warratahs album One of Two Things, released in 1999. Hunt contributed to two songs 'Fire Song' and 'Cape Turnagain'. 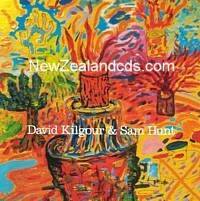 A year later Sam Hunt appeared on a CD tribute to another iconic New Zealand poem, James K. Baxter. The album, simply titled Baxter, featured musical interpretations of some of Baxter's best known poems. Hunt collaborated with contemporary composer Gareth Farr on 'The Ballad of Grady's Dream'. The finished piece isn't so much a song as the poem accompanied by a musical soundscape. Then in 2001 Hunt released a single that has featured on a previous Counting The Beat episode called 'Your Body Has No Flaw'. The single came out on on Pagan Records and is now sadly our of print. At the time Hunt gave interviews where he spoke of recording a whole album, perhaps working with Pitch Black. Unfortunately this wasn't to be. The new album with David Kilgour doesn't feature Hunt himself on the performances, a fact lamented by some critics. Instead his words are sung by Kilgour with a gentle, mostly acoustic musical accompaniment by Kilgour and his band The Heavy Eights that doesn't crowd out the poetry and will sound familiar to fans of Kilgour, amongst whom Sam Hunt ranks. In the podcast you will songs from each of the Sam Hunt releases above. I've also put videos from Sam Hunt and David Kilgour on the video page and you can also check out a podcast of Hunt's regular appearance on Kiwi FM here. would it perhaps be possible for yout to ask Tony Backhouse if you can post the Mammal album here?